From the bestselling author of High Fidelity, About a Boy, and A Long Way Down comes a highly anticipated new novel. 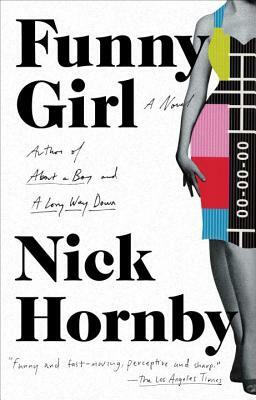 Funny Girl is the sixth full-length novel by British author, Nick Hornby. Set, for the most part, in the mid-to-late 1960s, Hornby’s latest novel gives the reader an intimate look at the making of a TV comedy series. His TV show, cast and crew are fictional, but Hornby firmly establishes the era with historical fact, using mentions of real-life politicians, personalities and events, as well as photographs, an advertisements and a cartoon strip. By adding extracts of scripts, a book cover, reviews, and program notes, he gives the whole thing an authenticity that will delight readers familiar with those years. Barbara Parker’s heroine is Lucille Ball, and her ambition is to be in comedy TV. She may be beautiful enough to win Miss Blackpool, but she gives it up in an instant to head to London, to become Sophie Straw, and, eventually, to audition for a BBC Comedy Playhouse show. Before too long, she is starring, as (ironically) Barbara from Blackpool, in a hugely popular sitcom series about a married couple, written by her comic heroes, Bill Gardiner and Tony Holmes, and titled “Barbara (and Jim)”. Characters and dialogue are Hornby’s strengths, and he does not disappoint with Funny Girl. It is impossible not to like and care about this diverse bunch, despite (or perhaps because of) their many and varied flaws: vanity, confusion about sexuality, selfishness, superficiality, timidity. There is plenty of humour, much of it dry, the sort that elicits wry chuckles rather than laugh-out-loud guffaws (“Davie remained undeterred. In his mind’s eye, he said, he always saw Clive as a cowboy. Clive had always thought that Davie needed his mind’s eye tested”). Topical themes of the sixties feature: feminism, homosexuality and the sexually permissive society (“He was talking about the times they all suddenly lived in, and how hard it was not to be a small boy in a sweet shop with no cash register”). This is a novel in which life imitates art, but also, often, the reverse, as the writers of the show rely on what they know. This funny and moving novel is another brilliant dose of Hornby at his best.